“5 countries with bonds safer than Treasurys” is today’s lead article at Marketwatch. For over a hundred years Wall Street has marketed one assurance to its customers above all others. According to the International Monetary Fund (IMF), the U.S. government’s net debt is now 89% of gross domestic product. By contrast, Germany—often thought of as Europe’s most financially sound nation—has net debts of only 56% of GDP. But if you want really, really safe, you should look a little further north of there—or a long way south. Scandinavian countries, and the Antipodes, have the best financial picture of all. New Zealand’s net debt is just 29% of its economy, and Australia’s is just 13%, according to the IMF. I imagine the list of countries with safer sovereign debt will get considerably longer if the US should wander into the dreaded default option. Yes, the US still benefits from the “exorbitant privilege” of being the world’s reserve currency and a safe haven in times of crisis. But privilege comes with responsibility. And the US is instead behaving like the spoiled child who owns all the toys. At some point our diffident behavior regarding our financial obligations will have a material cost. If the US is no longer capable of acting as the responsible senior party to the global financial marketplace, certainly there are other countries who would happily step forward. 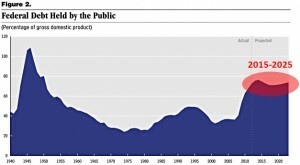 Total US debt – both public and private as a percentage of GDP – peaked in 2010 after a 30-year climb. As seen in the chart, this critical ratio is now steadily declining. 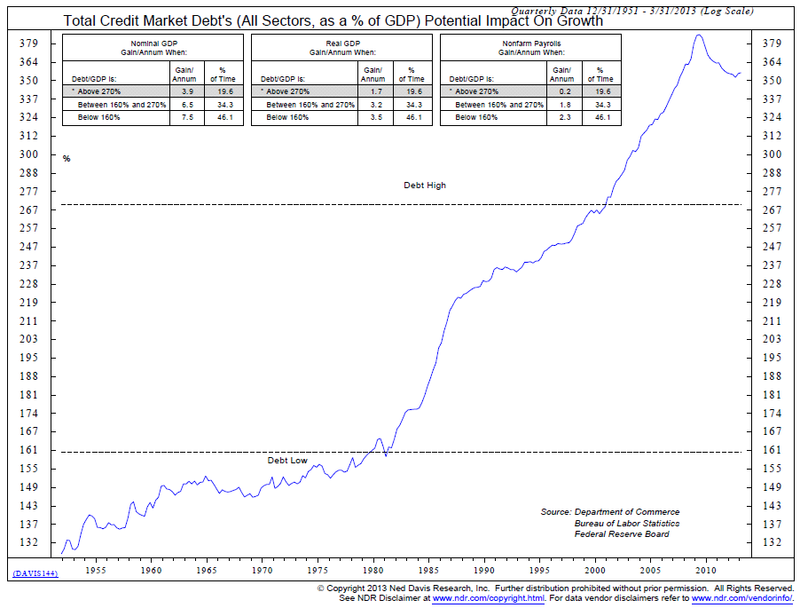 I have long argued that it was this number – total debt as a percentage of GDP – that was the crucial figure to watch, as opposed to all the attention being focused on the level of Federal debt only. As a society, we became way over-leveraged, thanks to the below-market costs of our borrowings, courtesy of our “friends” the Chinese and other factors. The debt ratio levels we reached were unsustainable and when the financial crisis hit, this veritable house of cards started to collapse around us. But thirty years of excess borrowing and spending will not be reversed in such a short time. We have a long road ahead before this ratio declines back into a more “normal” zone. Fortunately this can be accomplished by GDP (economic) growth in addition to an actual decline in indebtedness. I try very hard to avoid political commentary in this space. But as this particular exchange involved decisions that cost American taxpayers some $2Trillion, and counting, or about $6,500 per US living citizen, I thought it bore some relevance to the economic predicament we find ourselves in today. 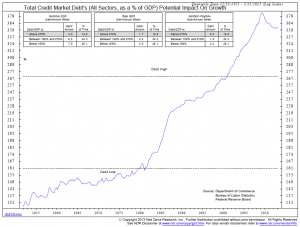 Have We Turned The Corner on Federal Debt? 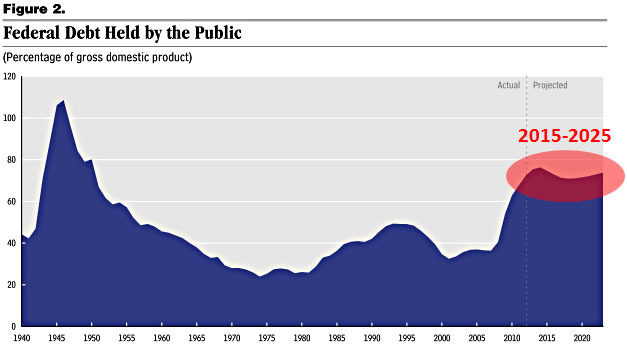 This projection of Federal debt by the CBO, courtesy of Kevin Drum, would seem to suggest so. Not that we are out of the woods by any means, but the 2009-10 alarming rate of public debt increases looks to be abating, a function of slower government growth and a pick in the US economy. For my upcoming 65th birthday, the Federal Government will start “gifting” me several thousand dollars each year for the rest of my life. Come April, I am eligible for Medicare, which in effect transfers a significant share of the cost of my healthcare to the Federal government. I was walking on air when I got my little red, white and blue eligibility card. This is hands-down the most valuable birthday present I have ever received. Gone will be a $600 per month (and rising) premium for a high-deductible health insurance plan. Gone also will be most of my out-of-pocket medical costs. In place of expenses that typically have run between $8,000-$10,000, I will instead be out-of-pocket $3,000-$5,000 per year. What to do with this four figure annual windfall is a pleasant dilemma. As excited as I am at this “found” money – and I am, no kidding – there is this nagging problem. Someone is going to have to pay for the shortfall between the actual (e.g. market) costs of my coverage and what I will pay in Medicare premiums and share of cost. Studies show this shortfall to average in excess of $100,000 per person over a current retiree’s lifetime. With 50 million Americans receiving Medicare today, rising to a projected 80 million over the next 20 years, it is not hard to understand why Medicare’s own projections show it facing an unfunded liability of $35 trillion. How the government is going to pay this inconceivable amount over the next 20-30 years is a question that no one has yet been able to answer. As they say, what cannot go on forever, won’t. We are going to have to come to terms with the reality that that we either pay more in taxes to sustain current subsidies, find a politically acceptable way to significantly reduce costs and/or trim Medicare benefits. But while I wait for the political forces to figure this problem out, I am unhesitatingly seizing my opportunity to join the millions of American seniors already enjoying their Medicare “free ride,” courtesy of our Federal government. NB: The time to sign up for Medicare Parts A & B is the period three months before to three months after your 65th birthday. You can do so quite easily here. 1. Obama can’t sell entitlement cuts to his base, or indeed Democrats in general, without Republicans agreeing to new revenues, and has offered them a straightforward compromise — one that would anger the base on both sides — based on the premise that total victory for the GOP is not an acceptable or realistic outcome. 2. Republican leaders can’t even begin to acknowledge that Obama has offered them a real compromise, because they can’t sell their base on the idea that the President is being flexible, let alone get them to seriously entertain accepting any compromise with him, because the base sees total victory over Obama as the only acceptable outcome. 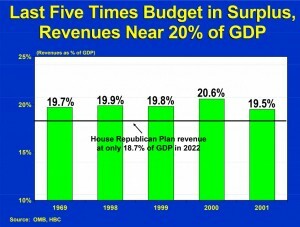 I try to avoid getting into the middle of these very partisan political fights, but the nation’s problem with longer-term deficits is one that will have to be addressed in a rational manner. In the above quote, the WP’s Greg Sargent sums up the issue so succinctly that both sides should be able to understand what the solution is. Brill’s is a long article but written with the depth of research and clarity you would expect in a book, not a news magazine article. Anyone concerned about the cost of healthcare, or our nation’s finances, needs to read it. At nearly 20% of GDP, the cost of healthcare in the US acts as a brake on our productive capacity. And it is a major contributor to our government’s deficit with Medicare/Medicaid now representing 24% of our Federal Government’s spending. 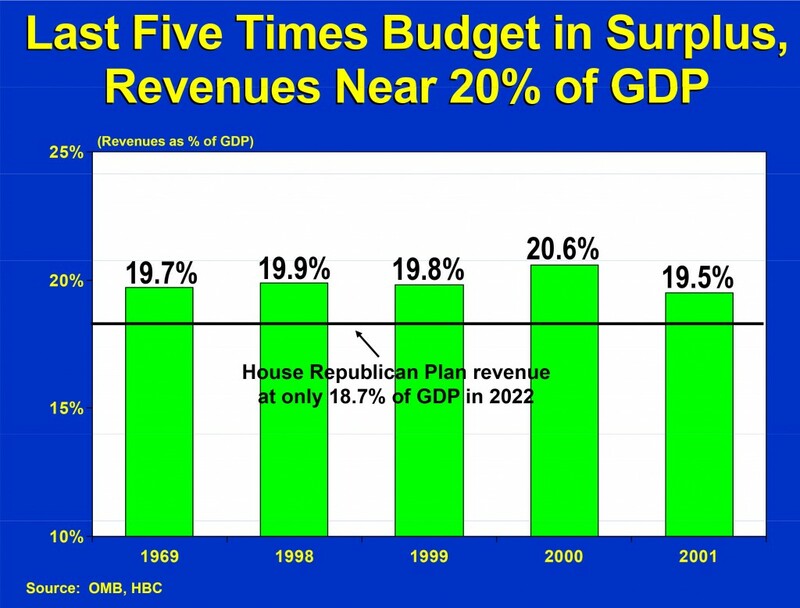 Healthcare is one of the few budget areas that is not shrinking. The only way we are going to get our national debt problem under control will be to address face-on our structural problem with healthcare delivery and finance. To do that will require a body politic and a public ready to face some difficult truths. Current Federal tax revenues are now running at 15.8% of GDP, at their lowest level in 60 years and far below the 20% level that was the case each time we balanced the national budget. The GOP solution, as seen in the chart, does not get us close.